As you all know very well by now, I have a 9 month old son. He loves to eat and is such a moose. :) I held back on feeding him solids longer than I did with my daughter (first child syndrome!) and I am glad that I did. Feeding a 9 month old can be VERY messy. I had to laugh when I saw those dinky cloth Velcro bibs that were meant for use when feeding a baby. How are you supposed to keep a baby clean with those things?!? How ridiculous. So as soon as Hannah was ready for solids I began to look for plastic bibs. My favorite bibs have become the crumb catcher bibs that snap. They are water proof and clean up really nicely. Bumkins is a children's company that offers parents products designed to keep your baby clean and happy...during meal time and during play time! I was really shocked by the selection that they have to offer on their website. Bumkins Finer Baby Products was founded by Jakki Liberman in 1989. Initially conceived as a means to provide her own young family with an alternative to disposable diapers, Jakki began the company with a single prototype, the All in One cloth diaper. This inventive design, which rivaled disposables in convenience, became the foundation of Bumkins product offerings. Bumkins Finer Baby Products soon expanded its product line into bibs, aprons, smocks and finally bags utilizing its signature soft, machine washable, waterproof fabric. With this product growth, Bumkins current best-selling product, the SuperBib® was launched in 1991 with great response. Product development continued in 2000 when Bumkins diversified its merchandise offerings by introducing the Natural Collection, an upscale product grouping which features organic cotton and natural fibers. 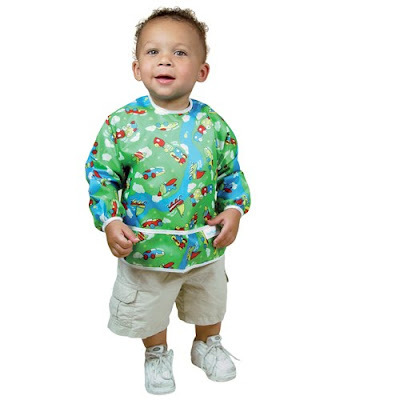 In 2005 Bumkins became a Dr. Seuss licensee and entered into the world of infant and toddler apparel. Currently, Bumkins Finer Baby Products is proud to offer a robust catalogue of baby merchandise available in wide range of independent and mass retailers, as well as the claim of creatorship to the number one selling bib in America, the SuperBib. Some products that I really love from Bumkins are from their Dr. Suess line of products which are SO darling!!! Also, I am really LOVING these Sleeved Bibs...aren't they great?!? For this review I was sent two Super Bibs...one in the Space Bear design and another in the Blue Owl design. I was very curious to see how these bibs stacked up to my current bibs that I am using. These Super Bibs fit very nicely on my son and velcro snugly around his neck. They measure 10" across and 9" long. The velcro is stronger than most that I have seen (which is why I usually pick snaps over velcro.). So that was a big plus for me. The coverage of these bibs is perfect as well...there is enough bib to cover the front of the baby and enough to go around their shoulders. My son was NOT able to get this bib off...oh believe me...he tried! :) Did I mention that these bibs are completely waterproof AND machine washable? Also, they are not stiff and hard like traditional bibs. Wonderful. 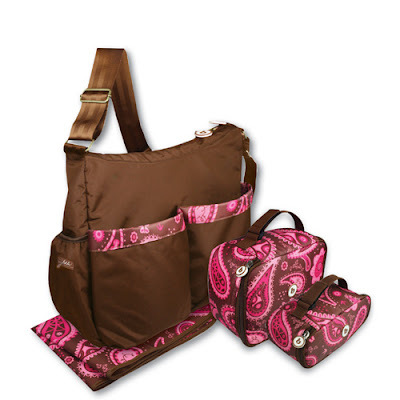 Bumkins also offers products like Diaper Bags, Lunch and Snack Boxes as well as Cloth Diapers! Like I said before, the selection is wonderful! The Super Bibs retail at $7.95 each or you can buy a three pack for $19.95...which are great prices for what you are getting. So, in my opinion...Bumkins is a really great company! I was very suprised that the Super Bibs were so soft and manageable. I love the fact that they are completely machine washable and waterproof as well. As a mom, I highly recommend Bumkins to any parent...wonderful products and long-lasting quality! Visit Bumkins and tell me which product interests you the most. You do not have to be a blogger to enter, but you must have a valid email where you can be reached should you win. If you do not leave an email address, it must be where I can easily find it. This giveaway is open to US residents and will end 4/22 at 11:59 pm EST. The winner will be chosen using random.org and will be notified by email. The winner will have 48 hours to respond, or another winner will be selected. 7. "Like" our photo on UPrinting's Facebook Page (you may have to "Like" Uprinting first). 2 entries, so 2 comments. Disclaimer: I received no monetary compensation for this post. I received 2 Super Bibs for review purposes. All quotes are from the Bumkins website and email. All thoughts and opinions are 100% mine. I've seen these bibs for a while and have wanted to try one, so that's my favorite thing from their website! I liked your Uprinting photo on FB! I'd love to try the sleeved bib and the art smock! I like the Dr. Seuss Short Sleeve Bodysuits that say Thing 1 and Thing 2. They're really cute for newborn twins. I follow Bumkins on twitter @Aerated. I'd like to get the Sage Organic Satin Touch Receiving Blanket for my expected new grandbaby. I *LOVE* their Dr. Seuss clothing...especially the Dr. Seuss Footed Sleeper. I love the adorable Dr. Seuss clothing!! I think their dirty duds wet bag looks great, too. I follow you via GFC. #1. I follow you via GFC. #2. I follow you via GFC. #3. It has to be the toddler bibs. We own 4 of them. and I'm definitely entering this giveaway for another one, so that should tell you how much use we get out them! Their contour diapers look really nice! Starter Bib looks nice too!! I am interested in the lunchboxes. Perfect for our adventures outside. I follow/like Bumkins on Twitter- danellejohns. i liek the flower garden art smock the best- too cute! I love the Dr. Seuss Coverall. Thank you for the lovely giveaway. I like the Dr. Seuss Footed Sleeper is really cute. I love their Dr. Seuess clothing! The Organic Towel & Washcloth Set interests me most! I like bumkins on facebook. I like the Dr. Seuss Coverall. I like the Art Smocks. I follow Bumkins on twitter.